At a recent teen parent support group, we spent a few minutes talking about how we grew up. We shared all kinds of funny stories about the crazy rules and expectations our parents placed upon us, how we rebelled and made things hard on them, and overall reminded ourselves what life was like growing up. It was a great conversation to have, especially with teenage parents. Because you see, these are young women and men who should still be actively “parented” but are now actively “parenting”. And in some cases, both are going on simultaneously. There are not too many situations you can be in as an adult volunteer where the student can realistically become the teacher. I’ve had some teen parent groups with teenagers whose children are both older than mine and even more numerous. Needless to say, this can level the playing field a bit and offer some energetic and revealing conversations about what it means to be a parent, no matter how old or young. One of the questions we pondered during this group revolved around what we wish our parents would have done differently. 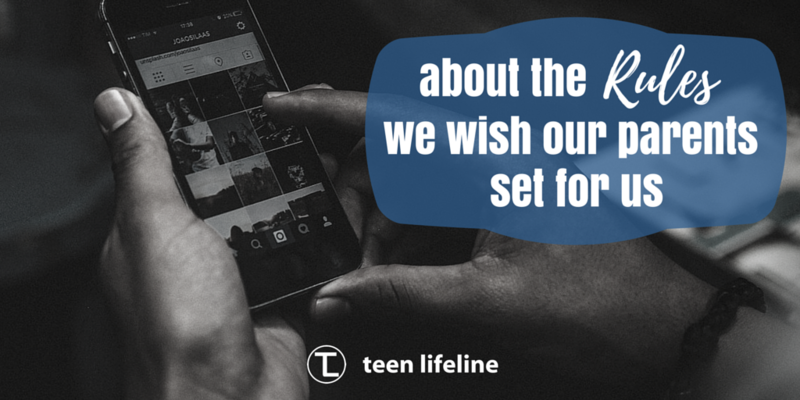 More specifically, we asked the group to share one rule or expectation that they wish their parents would have had for them that would have been really helpful. I love this question because it forces teenagers to be honest with themselves about their parents shortcomings, how it might have affected them, and it can even force them to see their parents as humans in light of their own new parenting journey. The one response that really hit me hard was from a mom who wished her parents would have kept her cell phone out of her room at night. Now, there is a lot to say about this topic specifically (I’ll refer you to this well timed blog article from our friend, Sarah Brooks on this very subject), but I think there is something to hear from this teen mom. There are certain things we can assume about teenagers and what they want/need. Prevailing logic would suggest teenagers want to be on their phones at all times. This same logic would suggest any attempt to put boundaries and structures on something so sacred (this can be applied to various other things teenagers might find sacred) would be met with all-out war. With this particular issue, I have seen both sides. While walking through their normal day-to-day lives, to ask a teenager to give up their connectivity via the internet might seem like asking them to lop off one of their appendages. Yet, I have also been on wilderness trips with teenagers where our phones didn’t work and have had them talk with me about the relief they felt from not having to always pay attention to every incoming communication. But the bigger issue here is finding a way to place healthy boundaries on things like cell phones, time spent with friends, schoolwork, jobs, sports, etc. We assume giving way to anything that brings happiness or immediate fulfillment is always a good thing. But in the wake of this, balance is lost. Boundaries become murkier and less clear. The bedroom is no longer for sleeping, it’s for texting. Our sports are no longer for exercise and fun, but for winning at all costs. Family time is no longer a foundation but more for utility. These boundaries are important to learn early and often for teenagers. And while it is hard to get them to admit, they really appreciate someone older and wiser coming in and restoring order and balance through setting up healthy boundaries for the things we enjoy.